During our stay we went to Santa Elena a rual mountain village. We went there to share our abundance of school supplies and cool weather clothing which the team members had brought with them. Santa Elena is about 20 mins up a steep, winding gravel road. It is a an agricultural village growing crops like coffee, vegetables and beans. In the rainy season Santa Elena is isolated because the road is washed out. Even with our little truck we had to stop twice, get out and walk while the guys pushed the truck until it got traction again. We happily delivered pencils, erasers, construction paper, vitamns, ribbon for the girls hair, marbels for the boys and cool weather clothing. Because of it's altitude Santa Elena is cool and in the evening it is actually cold. No need for a fan or air-conditioning there. On our way down the mountain, we lost the brakes on the truck. I was sitting in the cab with the driver, Adrian. 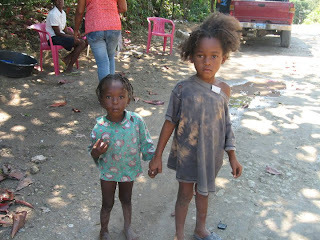 There were 8 others in the back of the pick-up, riding Dominican style. We came around a corner a bit too fast and I knew by Adrian's frantic look that we had no brakes. As we rounded the corner I saw the road ahead going straight down. Thankfully, Adrian knew immediately he had to try to stop the truck before we gained more speed. He turned the wheel into the mountain and I began to pray. 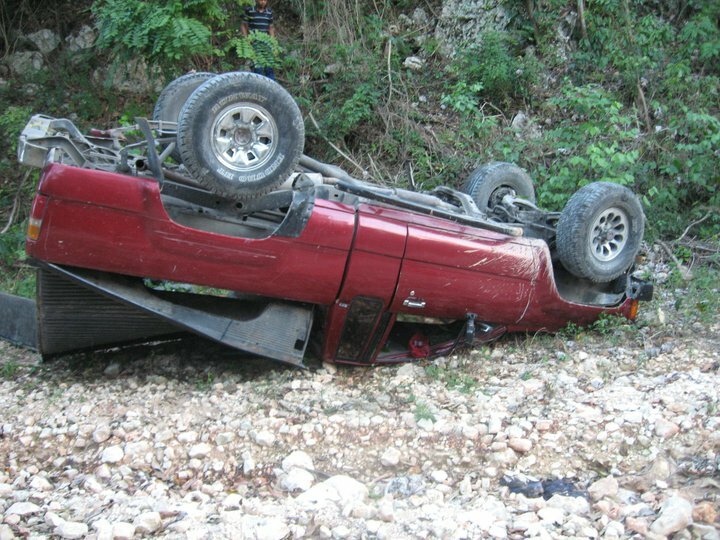 I saw the rain washed "gutter" and as the driver's side tires went into the gutter I heard screams....then a flip....roll....slide.....and silence.......Then Adrian screaming for Yanet his cousin who had been riding in the back of the truck. As I continue to pray Adrian scrambles out the window. I was very calm, preparing myself for what I might find once I leave the cab. Suddenly I hear one of my friends say "we have to get the truck off of Scott....we have to get the truck off Scott!" Next I hear myself yelling "my husband, my husband, I have to help my husband!" I scramble out the broken window and see the edge of the truck bed on my husbands head with his body still in the truck bed and lots and lots of blood. Instinct tells me I can't help with my arms, they are too weak.......But God gave me legs as strong as tree trunks. So I lay on my back and get my feet under the edge of the truck as Scott yells, "it's crushing my head - get it off quick, it's crushing my head!" I start pushing with both legs with all my might as we lift the truck enough for him to crawl out. I am afraid at what I might see once he is free. He is bleeding from the nose as he was face down on the ground with the truck on the back of his head. I look at his head, lots of blood, but a small wound. Scott is okay. Everything seems in slow motion....Adrain checks his cell phone, sees he has no service and immediately starts walking down the mountain. In a moment a see a motorcycle and Adrian jumping on it. Thank God there is a police check station at the bottom of the mountain. Adrian will be able to call for help soon. Everyone seems in shock. Yanet is laying on the ground. She is not moving, I go to her, she can't talk, I ask where it hurts, she touches her chest, I fear internal damage. We pray together. The guys are now worried because the truck is leaking fluids, both propane and gasoline. We decide we have to take the risk and move Yanet away from the truck. As we lay her back down I see the injury. There's an entry wound on her upper hip, I see deep in the flesh. We pray again. She says, rapido, rapido. She also knows she is badly injured. As scared as I am for Yanet I am calm, I am thankful we are all alive. There are road rashes, bumps and bruises, but there is not even one broken finger! In a few moments I see Pedro's brand new white Ford Explorer coming up the mountain. And he is moving! Pedro is Yanet's brother-in-law, our friend and the owner of the Texaco gas station in Barahona. We load Scott, Yanet and my friend Kelly all bleeding into the light beige interior. Yanet says "rapido" again. t seems just a few minutes and I see Pedro's Explorer again. We are loaded in and taken to a small, private clinic. I call Franklin to translate for me. 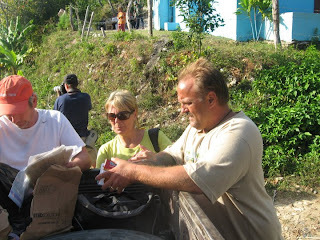 When we arrive the clinic is already full of family and friends from Habanero. In an accident like this, they would expect someone to die. In the 7 years since I've worked there I've known five people that have died in our little village. Family and friends are all praising God that we are all alive. Gloria Dios is the chant! We are all in the emergency room together, there are no HIPPA laws in the DR. Scott is ok just a few stitches, Kelly is okay, road rash and stitches in his head also. Lucia has a whiplash, Luis has a backlash. Miraculously Gary, Jake, Timo, Adrian and myself are almost untouched. I look at Yanet's x-ray.......another miracle........lots of trauma to the chest and even though a long piece of glass was injected into her, the glass has missed all her organs and her spine. The piece of glass broke into three pieces and I can see them clearly on the x-ray. I watch as the doctor begins to remove the glass. He tells me Yanet will be all right. As each person is bandaged I put them in a car headed for Habanero so they can rest. I stay at the clinic with Yanet. She will be staying for a few days as will Lucia for observation. As the clinic quiets down I begin my prayers of thankfulness. Once the girls are settled in their rooms Germo says now it's time for me to rest and he will take me home. In the privacy of the car I begin to cry. I've held it all together but now the tears flow. Germo asks why I'm crying and I say "I'm not going to Santa Elena again, it's too dangerous." His reply not only surprises me but uplifts me. Germo says "Don't say that Brenda. Your were doing God's work in Santa Elena and Satan wasn't too happy about it. If you don't go back to Santa Elena then Satan wins. But if you go back then God will be victorious!" And that is the moment I started planning my next trip to Santa Elena. We survived for a reason, becasue God has a plan for us. 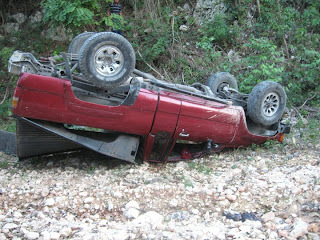 Just one week before our accident a man was coming down that same mountain, he was alone in a pick up truck, he lost his brakes and he lost his life that day. It could have been us, but it wasn't........Life goes on..................I'm looking forward to what God has planned for us! We return to the Dominican in June. Since the Jan. 2010 earthquake in Hait (about 100 miles from Habanero) there are many new Haitian families relocated to Habanero. One family was brought to our attention while the dental team was here. The fathers name is Keni and he has a wife named Adriana and two baby boys one is 1 year 8 months and the other is 8 months. Of course there is not work so he is barely scratching up enough to feed everyone. He is very timid and shy and doesnt ask for anything. When I first went to the home Keni said I could have one of the children, I could pick either one of them. He said he could not feed them. So it would be good for me to take one. It broke my heart to hear those words and see the mother so sad and she was sick as well. Thank God she is able to nurse both the children or they probably would not have survived so far. We have brought them vitamins, rice and on Saturday Ramon fixed the water which ran out of the ground continuously making a great breeding ground for misquitos. We can them a covered bucket and talked with them about boiling the water for the children. They were very humble and thankful. Seeing these people and knowing I have so much back home in America makes me want do more. I know I cannot fix all the problems in this little village. But, I also know I can do something. Providing some simple basics like a pipe and shut off valve can make a difference in comfort (no muddy yard) and health (not as many misquitos which carry malaria and dungue fever). I am so very thankful for family and friends back home that help us in so many ways - YOU are making a difference here. Today was Friday and it was a fiesta day at school. The Dominicans celebrate “Student Day” with a fiesta of fun and food! The tradition calls for students to dress with their Sunday best for school and to bring a gift to share with the students. The gift is usually some sort of food or something to drink. Only a few students are able to bring something in Habanero, but the teachers add a little something and we add a little something and suddenly we have a full blown party! Yanet brought her television and a neighbor brought their DVD player and we started the day watching a DVD, which is a real treat for the children. While the children watched the DVD the adults were busy making the food. One child brought bologna, another a pc of cheese, there was some potato salad, crackers, cola, 7up, suckers, the works! We ended the fiesta with presentations of a special gift to one child with the best attendance from the 4year old, kindergarten and 1st grade classes. We are trying to reinforce the value of attending school regularly. A higher attendance rate is one of the long-term projects close to my heart. The project really requires someone to be here all the time helping the teachers with the program and leading by example. It seems a simple concept, and something we take for granted in the USA. Here it is more complicated. Many parents do not read or write. Even if you have an education the unemployment rate is hovering at 75% here so there is no work. The value of education is not clear in this village. It takes consistency, longevity and commitment to a generation of children for them to really understand the value of education. I see education leading to results of employment in the future and basic needs being met. But for the time being, for these children education is a self-esteem builder. I see them proudly walking to school with their uniforms – and happily repeating the abc’s and 1,2,3’s for me. Sometimes even in English! And so we work day by day, minute by minute, one child at a time which brings hope for the future! For some reason I lost the photos of Esmeralda and Brendita. Imagine that! In this country anything can happen! I can’t believe we have been here for almost a month already. The time has flown by. I can see progress in Habanero and am in hopes of having internet there one day. But for now, it is a trip into Barahona to get on the internet and it is SLOW! Remember dial-up? Yeah, you know what I mean….. It rained tonight and that means the misquitos will be out tomorrow night. I love that the rained cooled things off and sent all the children running for home. Sometimes the house is surrounded by little ones hungry or just plain curious. We spent half the day at the school tpday – beginning at 8am. I am there a few minutes early so I can applaud the ones that are on time and encourage the ones that are late to be one time. Attendance is up and down. We have 81 children enrolled, but most days have only 50 attending. Some are sick and some didn’t get enough sleep and they are just plain too tired to attend. It’s a struggle, but we’re happy for the parents that are “getting it”! They are faithful and get their children up, washed and ready for the day. We spent the other half of the day taking Brendita and Esmeralda to the doctors and filling prescriptions. Brendita is set for lab tests on Feb 1, those results seen by a Dominican doctor on the 2nd and 8am appoint on Feb., 8th with an American doctor that hopefully will be able to do surgery on both her eyes before he goes back home. I’m posting a picture of her smiling face! We are thankful for our friends at the clinic who see our children for free when I am here and can personally take them in. The free clinic in the next village LaHoy has been closed for three months now. The government hasn’t paid the doctors for five months and so they decided to walk out. Daily life here………………Simple and complicated at the same time.